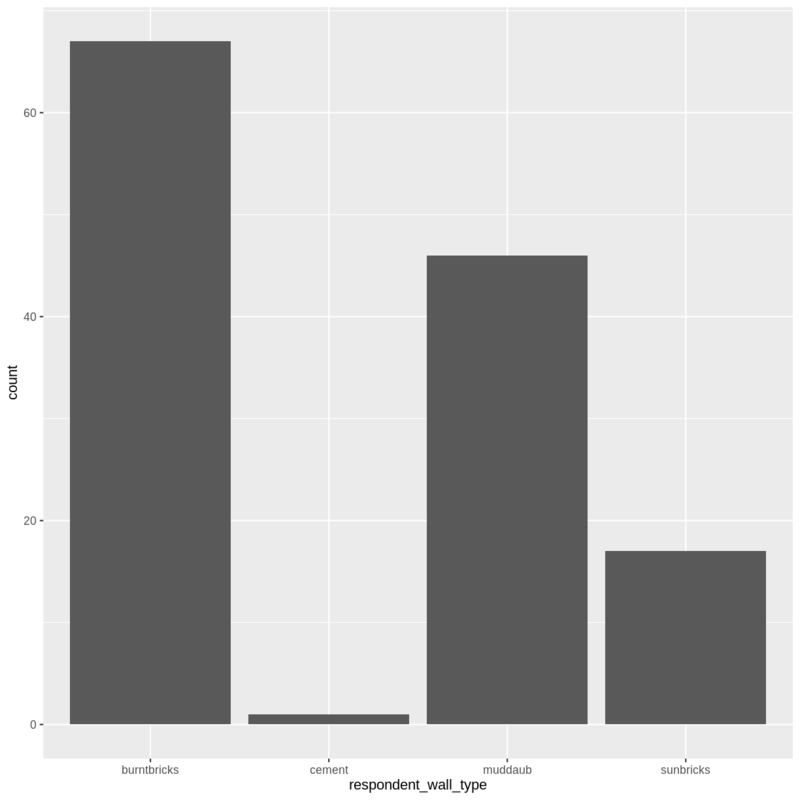 What are the components of a ggplot? 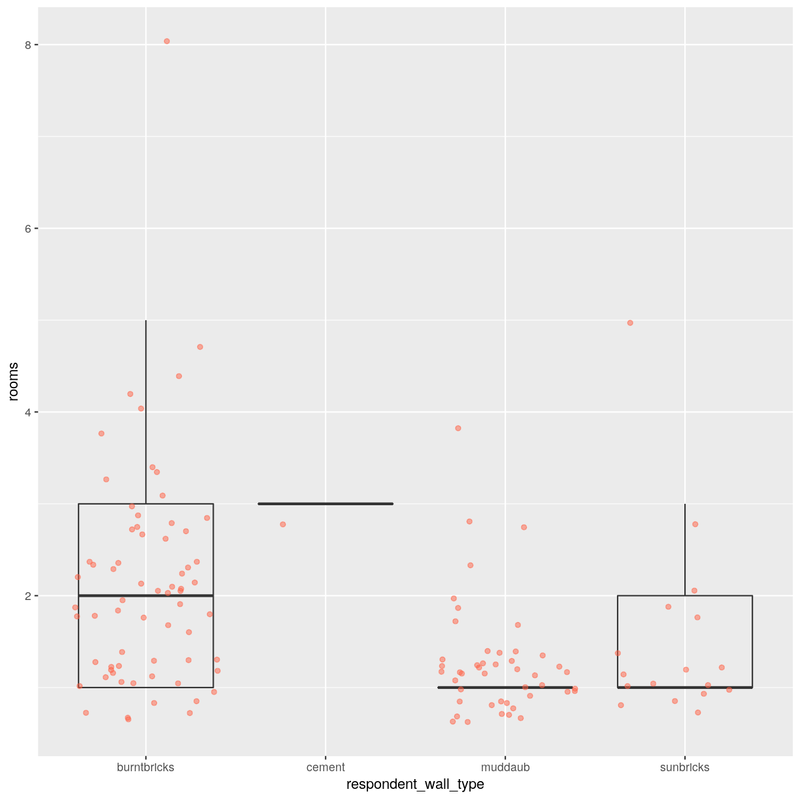 How do I create scatterplots, boxplots, and barplots? How can I change the aesthetics (ex. colour, transparency) of my plot? How can I create multiple plots at once? 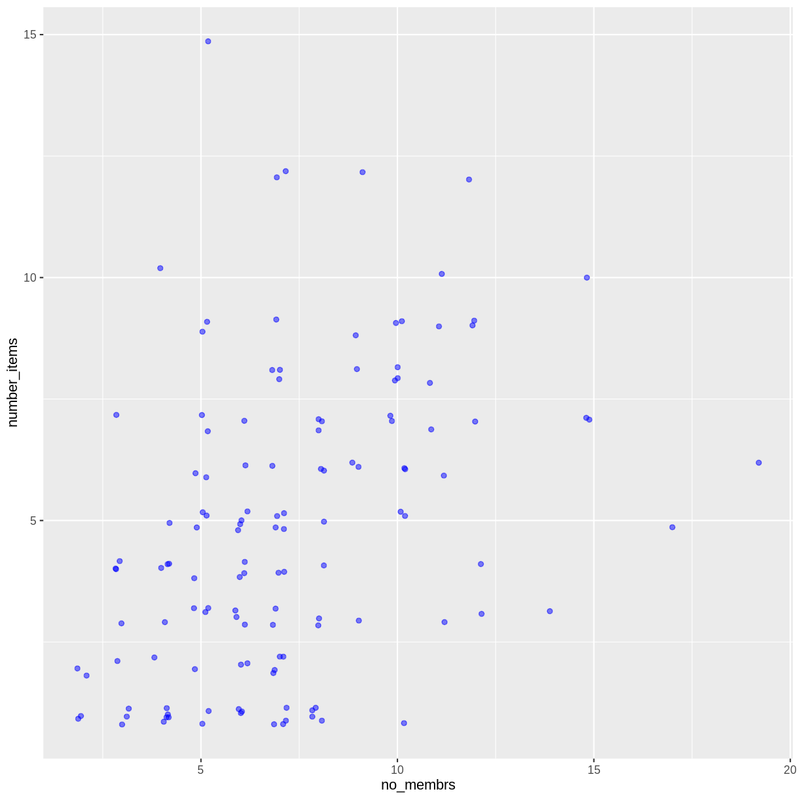 Produce scatter plots, boxplots, and time series plots using ggplot. 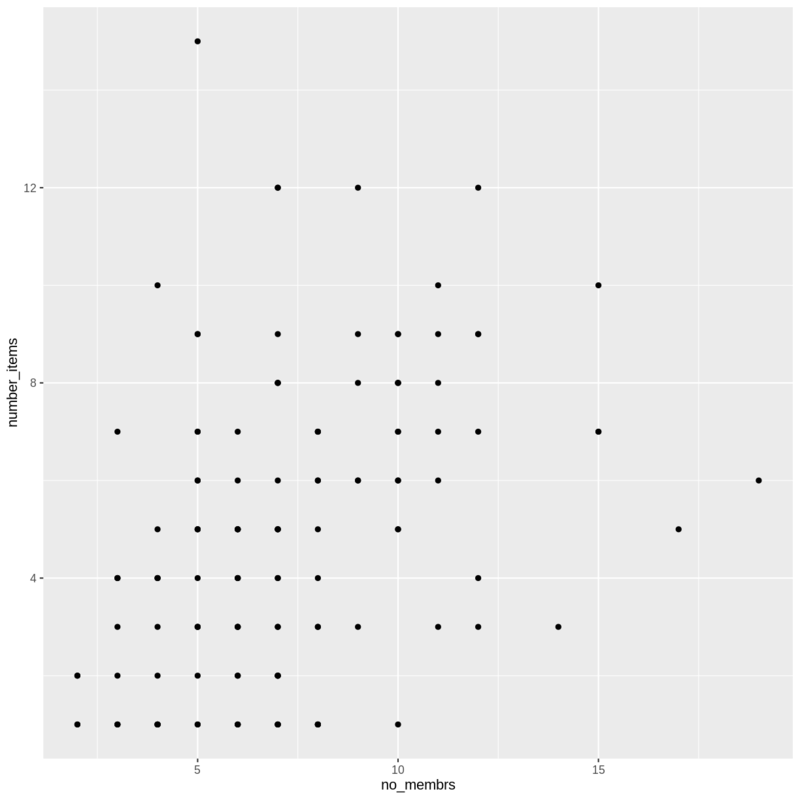 Describe what faceting is and apply faceting in ggplot. 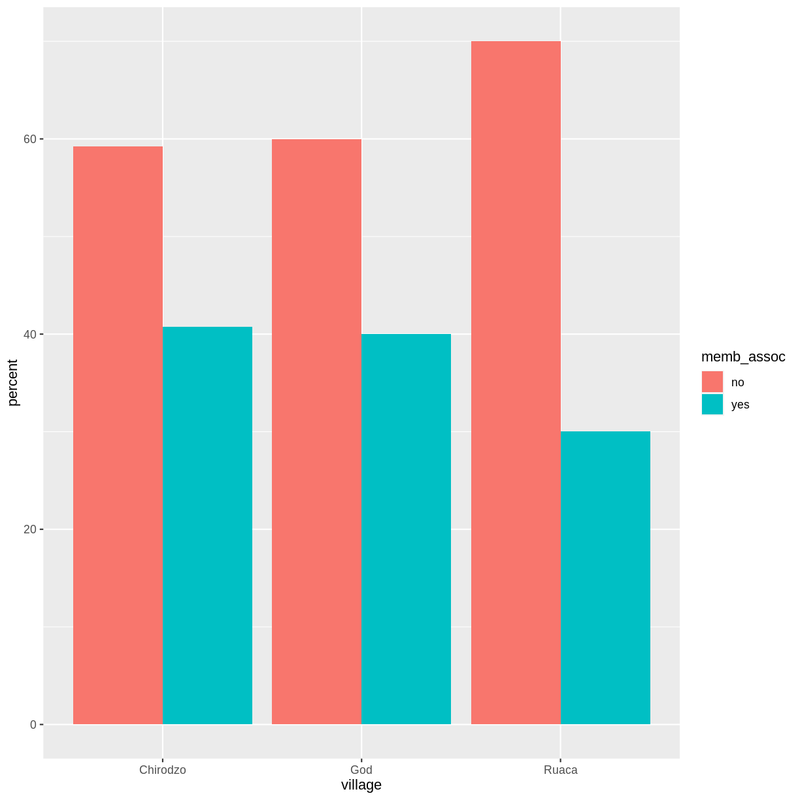 Modify the aesthetics of an existing ggplot plot (including axis labels and color). Build complex and customized plots from data in a data frame. We start by loading the required package. 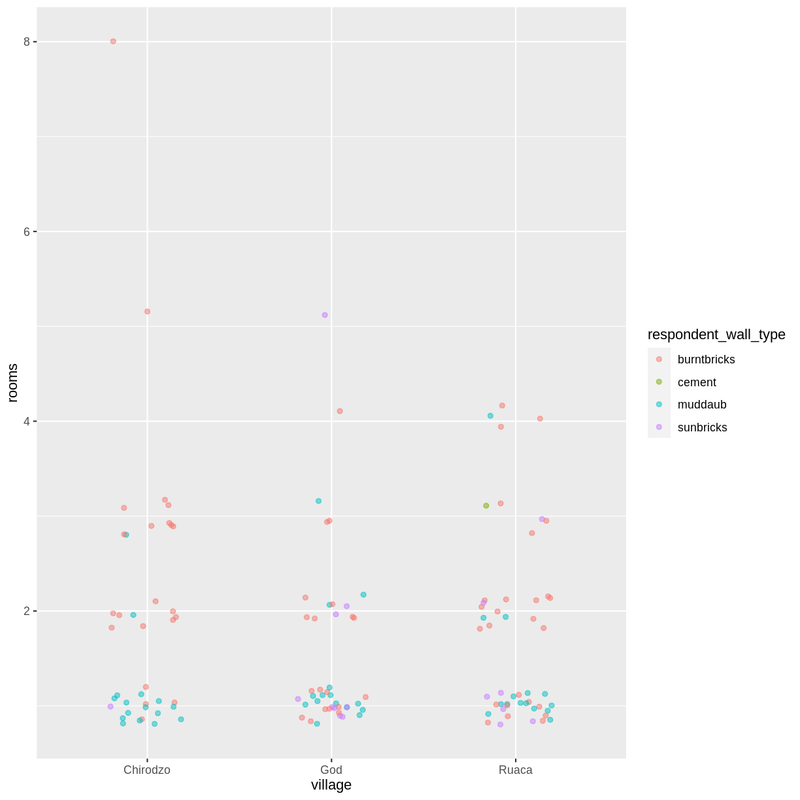 ggplot2 is also included in the tidyverse package. If not still in the workspace, load the data we saved in the previous lesson. See spec(...) for full column specifications. ggplot2 is a plotting package that makes it simple to create complex plots from data stored in a data frame. It provides a programmatic interface for specifying what variables to plot, how they are displayed, and general visual properties. Therefore, we only need minimal changes if the underlying data change or if we decide to change from a bar plot to a scatterplot. This helps in creating publication quality plots with minimal amounts of adjustments and tweaking. 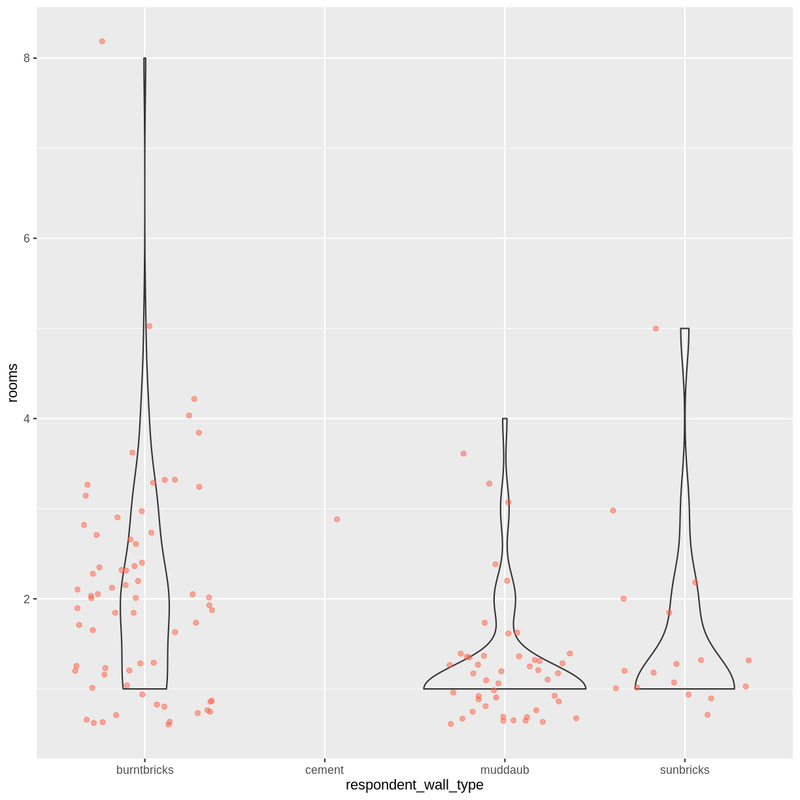 ggplot graphics are built step by step by adding new elements. Adding layers in this fashion allows for extensive flexibility and customization of plots. define a mapping (using the aesthetic (aes) function), by selecting the variables to be plotted and specifying how to present them in the graph, e.g. as x/y positions or characteristics such as size, shape, color, etc. 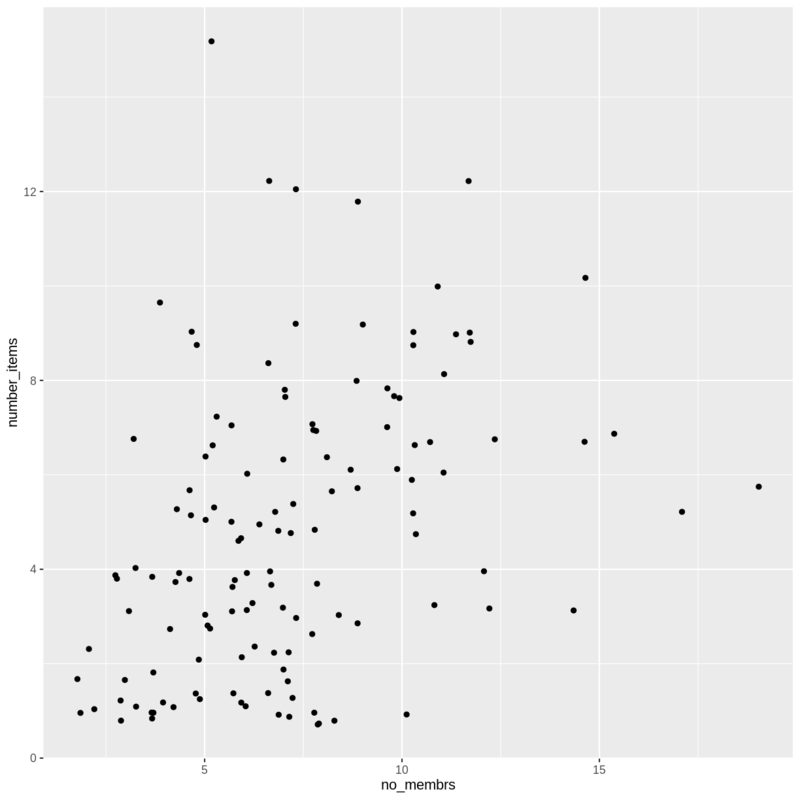 geom_point() for scatter plots, dot plots, etc. geom_line() for trend lines, time series, etc. Anything you put in the ggplot() function can be seen by any geom layers that you add (i.e., these are universal plot settings). This includes the x- and y-axis mapping you set up in aes(). You can also specify mappings for a given geom independently of the mapping defined globally in the ggplot() function. The + sign used to add new layers must be placed at the end of the line containing the previous layer. If, instead, the + sign is added at the beginning of the line containing the new layer, ggplot2 will not add the new layer and will return an error message. That only helped a little bit with the overplotting problem. We can also introduce a little bit of randomness into the position of our points using the geom_jitter() function. There appears to be a positive trend between number of household members and number of items owned (from the list provided). This trend does not appear to be different by village. Use what you just learned to create a scatter plot of rooms by village with the respondent_wall_type showing in different colors. Is this a good way to show this type of data? We can see that muddaub houses and sunbrick houses tend to be smaller than burntbrick houses. Notice how the boxplot layer is behind the jitter layer? What do you need to change in the code to put the boxplot in front of the points such that it’s not hidden? Boxplots are useful summaries, but hide the shape of the distribution. For example, if the distribution is bimodal, we would not see it in a boxplot. An alternative to the boxplot is the violin plot, where the shape (of the density of points) is drawn. 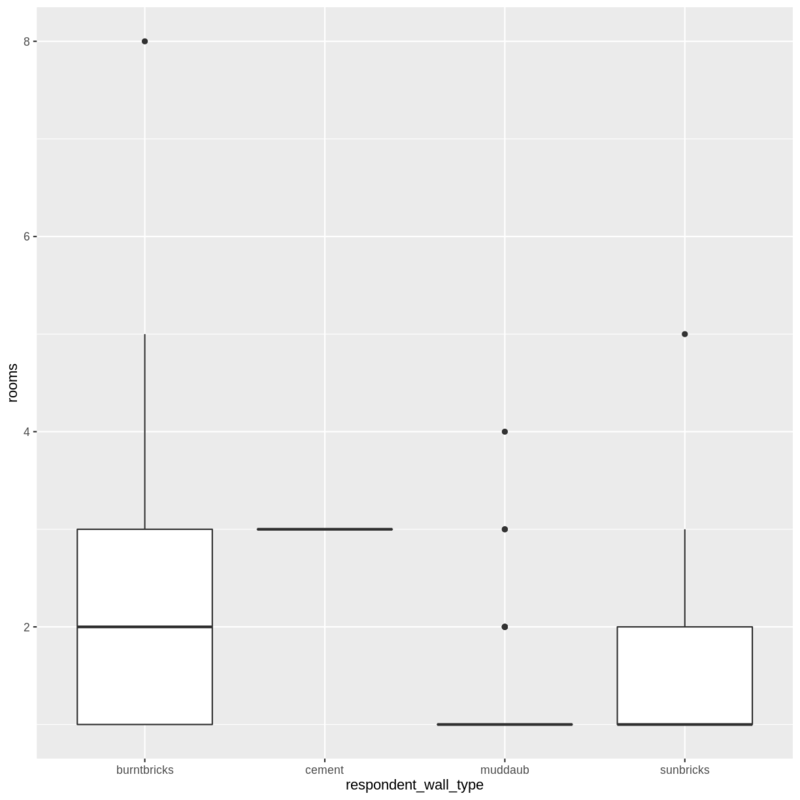 Replace the box plot with a violin plot; see geom_violin(). So far, we’ve looked at the distribution of room number within wall type. Try making a new plot to explore the distribution of another variable within wall type. Create a boxplot for liv_count for each wall type. Overlay the boxplot layer on a jitter layer to show actual measurements. 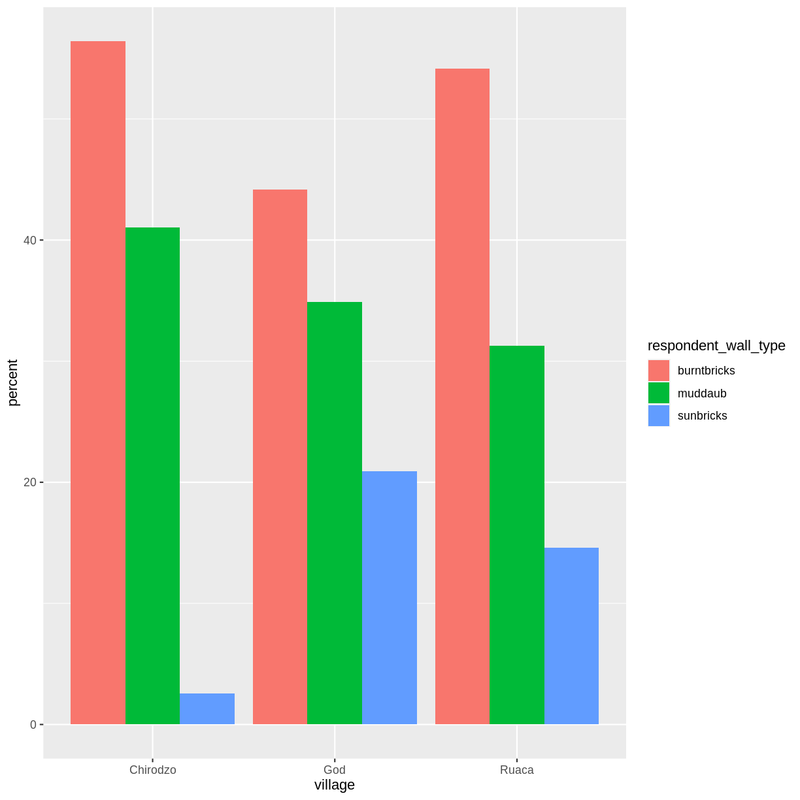 Add color to the data points on your boxplot according to whether the respondent is a member of an irrigation association (memb_assoc). 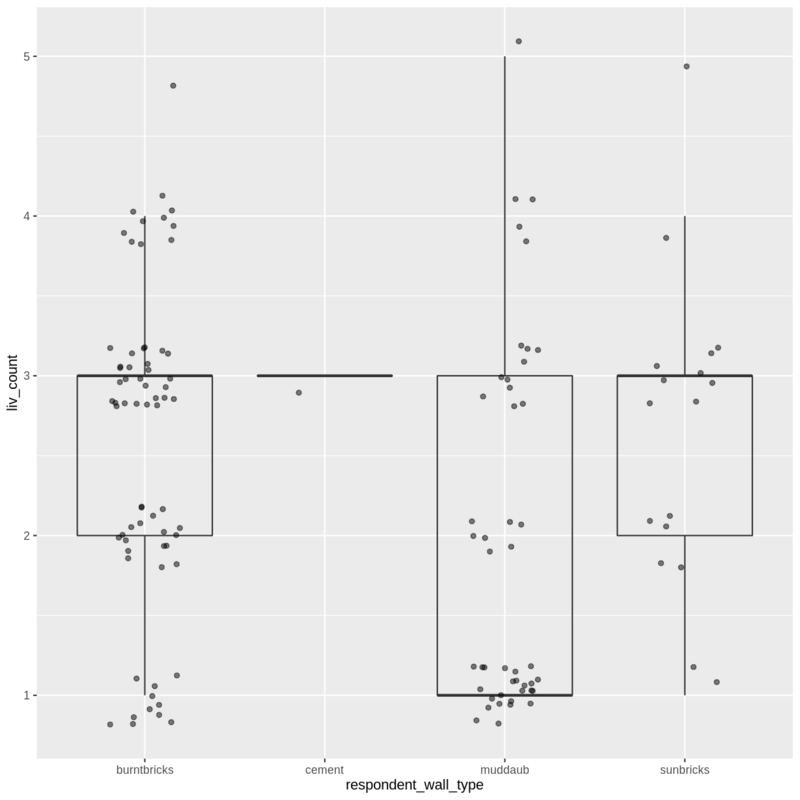 Barplots are also useful for visualizing categorical data. By default, geom_bar accepts a variable for x, and plots the number of instances each value of x (in this case, wall type) appears in the dataset. 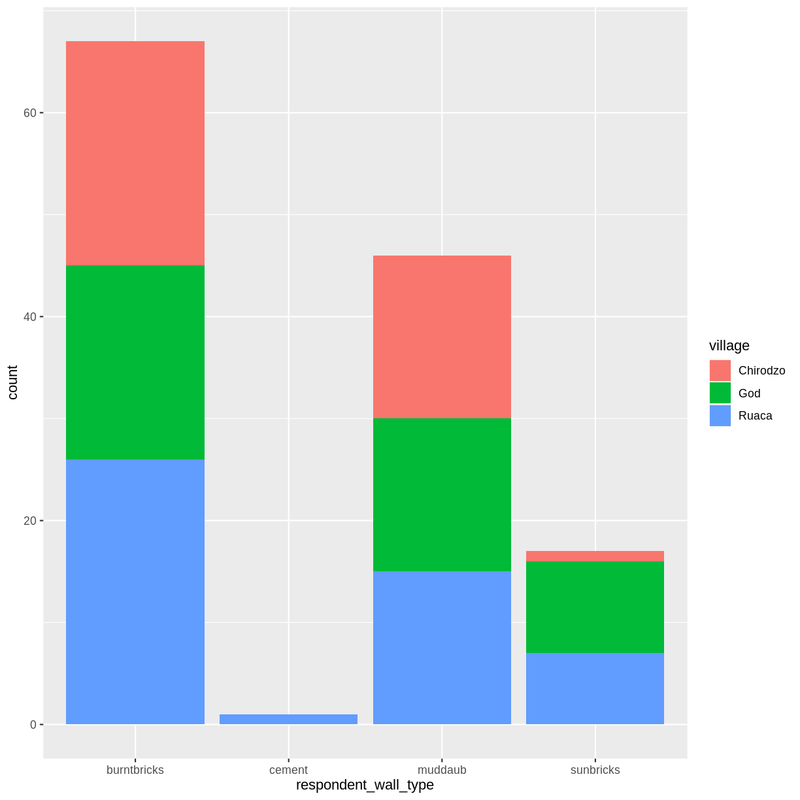 We can use the fill aesthetic for the geom_bar() geom to color bars by the portion of each count that is from each village. This creates a stacked bar chart. These are generally more difficult to read than side-by-side bars. 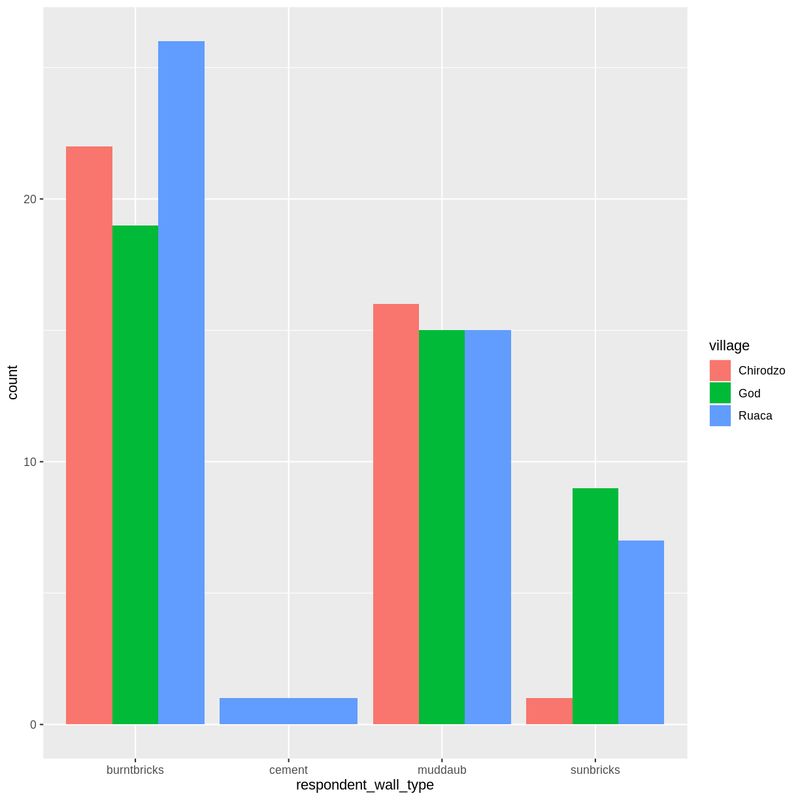 We can separate the portions of the stacked bar that correspond to each village and put them side-by-side by using the position argument for geom_bar() and setting it to “dodge”. 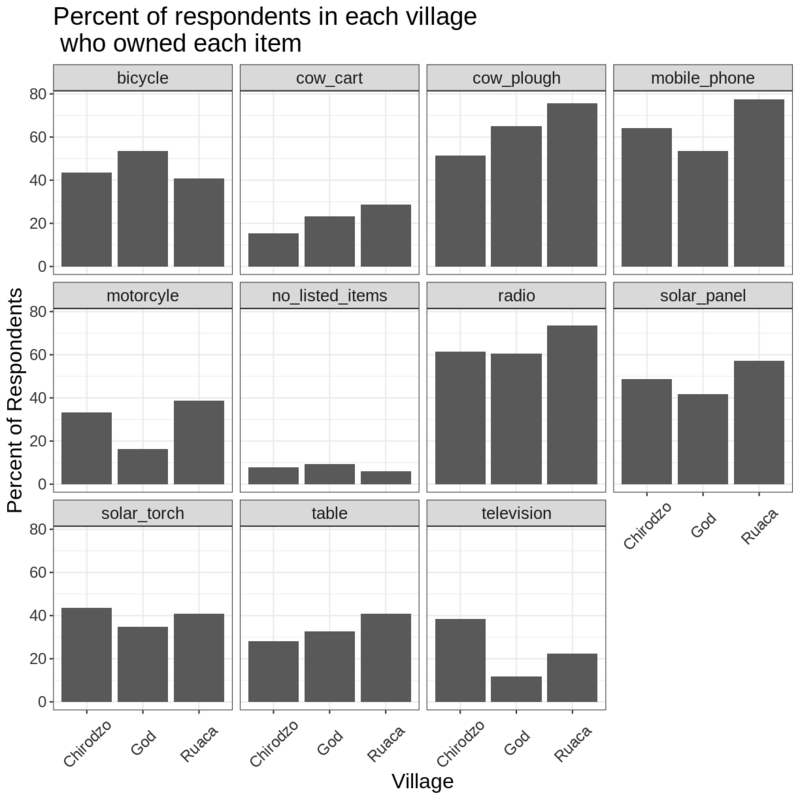 This is a nicer graphic, but we’re more likely to be interested in the proportion of each housing type in each village than in the actual count of number of houses of each type (because we might have sampled different numbers of households in each village). To compare proportions, we will first create a new data frame (percent_wall_type) with a new column named “percent” representing the percent of each house type in each village. We will remove houses with cement walls, as there was only one in the dataset. 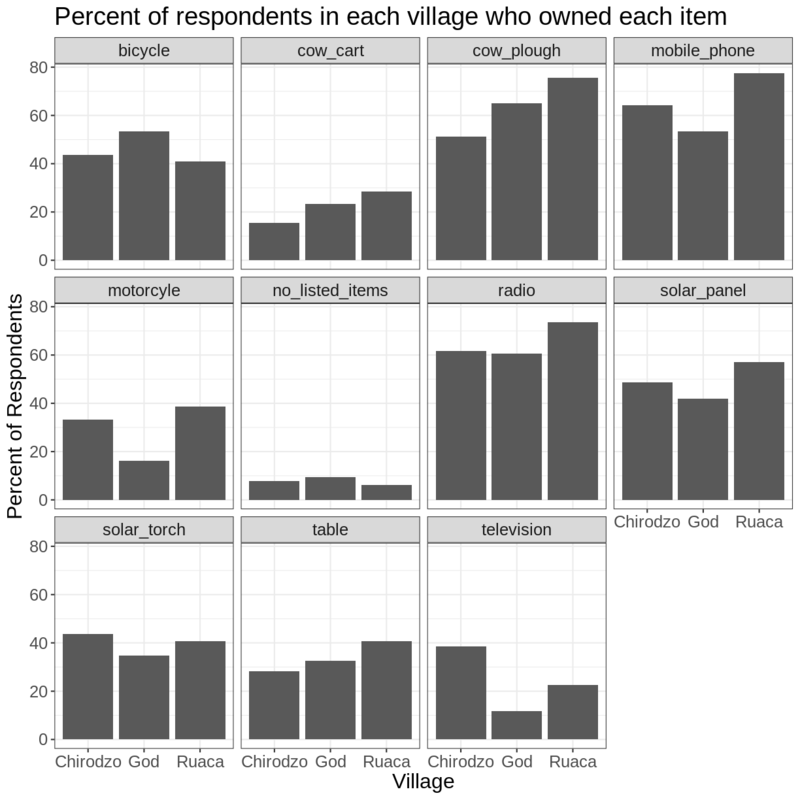 Now we can use this new data frame to create our plot showing the percentage of each house type in each village. 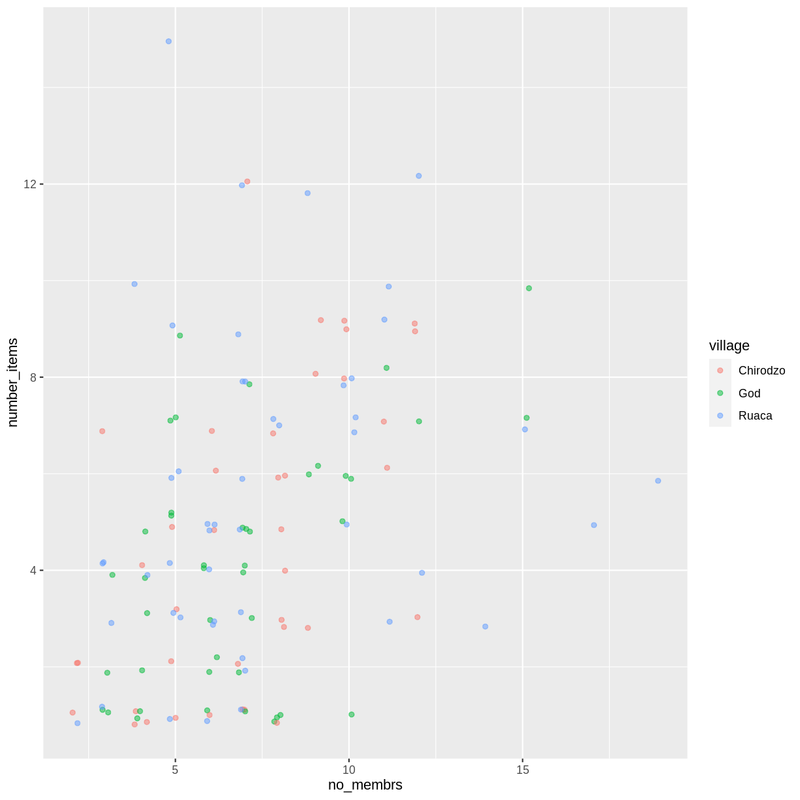 Create a bar plot showing the proportion of respondents in each village who are or are not part of an irrigation association (memb_assoc). Include only respondents who answered that question in the calculations and plot. Which village had the lowest proportion of respondents in an irrigation association? Ruaca had the lowest proportion of members in an irrigation association. By default, the axes labels on a plot are determined by the name of the variable being plotted. 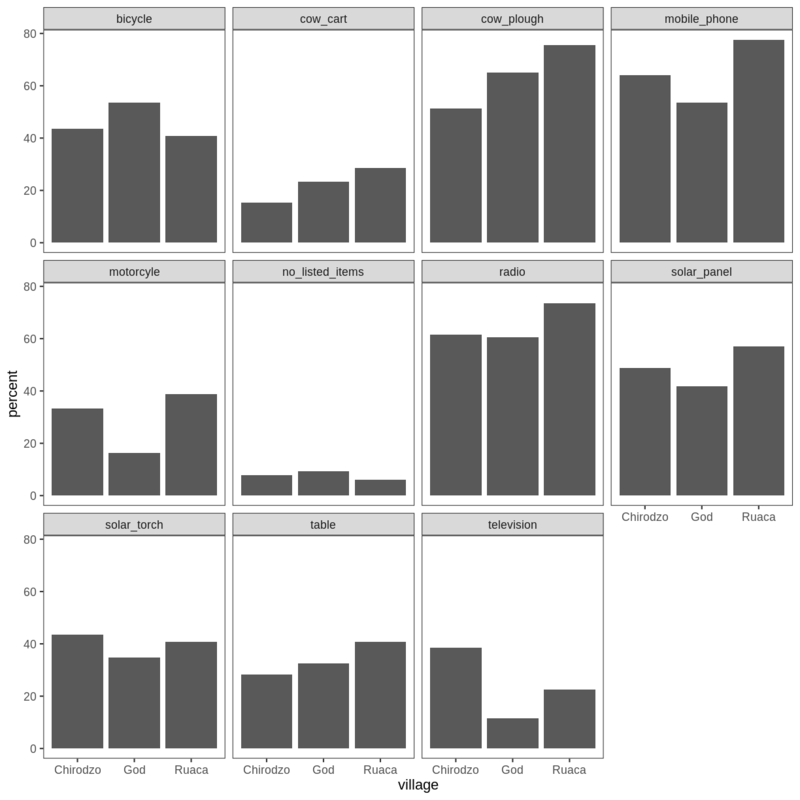 However, ggplot2 offers lots of customization options, like specifying the axes labels, and adding a title to the plot with relatively few lines of code. We will add more informative x and y axis labels to our plot of proportion of house type by village and also add a title. 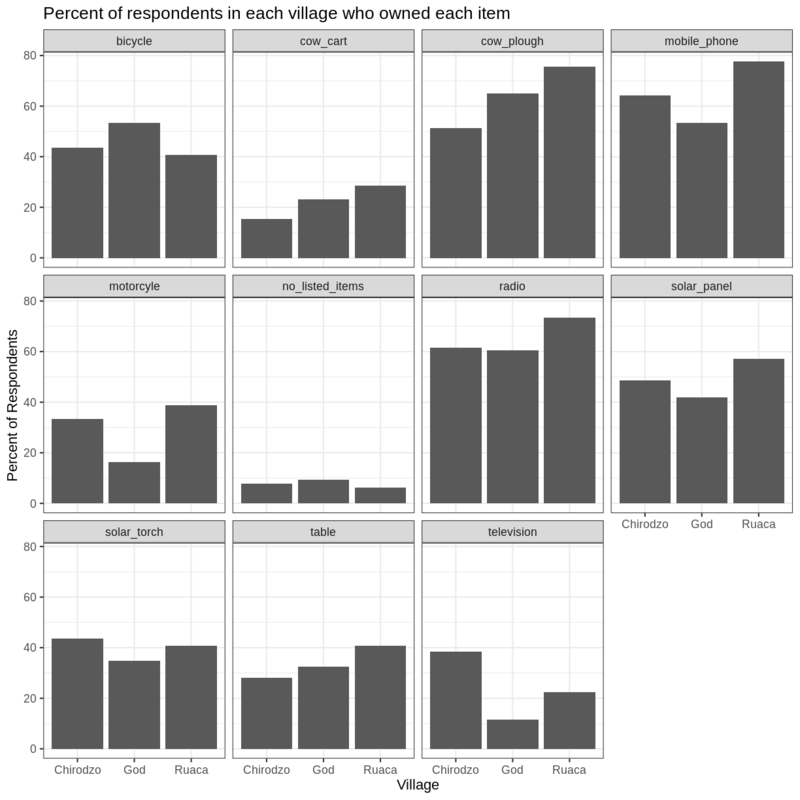 Rather than creating a single plot with side-by-side bars for each village, we may want to create multiple plot, where each plot shows the data for a single village. This would be especially useful if we had a large number of villages that we had sampled, as a large number of side-by-side bars will become more difficult to read. Click the “Zoom” button in your RStudio plots pane to view a larger version of this plot. To calculate this percentage data frame, we needed to use the case_when() parameter within mutate(). In our earlier examples, we knew that each house was one and only one of the types specified. However, people can (and do) own more than one item, so we can’t use the sum of the count column to give us the denominator in our percentage calculation. Instead, we need to specify the number of respondents in each village. Using this data frame, we can now create a multi-paneled bar plot. In addition to theme_bw(), which changes the plot background to white, ggplot2 comes with several other themes which can be useful to quickly change the look of your visualization. The complete list of themes is available at http://docs.ggplot2.org/current/ggtheme.html. theme_minimal() and theme_light() are popular, and theme_void() can be useful as a starting point to create a new hand-crafted theme. The ggthemes package provides a wide variety of options (including an Excel 2003 theme). The ggplot2 extensions website provides a list of packages that extend the capabilities of ggplot2, including additional themes. Experiment with at least two different themes. Build the previous plot using each of those themes. Which do you like best? Take a look at the ggplot2 cheat sheet, and think of ways you could improve the plot. Note that it is also possible to change the fonts of your plots. If you are on Windows, you may have to install the extrafont package, and follow the instructions included in the README for this package. See if you can make the bars white with black outline. Try using a different color palette (see http://www.cookbook-r.com/Graphs/Colors_(ggplot2)/). After creating your plot, you can save it to a file in your favorite format. The Export tab in the Plot pane in RStudio will save your plots at low resolution, which will not be accepted by many journals and will not scale well for posters. Instead, use the ggsave() function, which allows you easily change the dimension and resolution of your plot by adjusting the appropriate arguments (width, height and dpi). Make sure you have the fig_output/ folder in your working directory. Note: The parameters width and height also determine the font size in the saved plot. ggplot2 is a flexible and useful tool for creating plots in R.
The data set and coordinate system can be defined using the ggplot function. Additional layers, including geoms, are added using the + operator. Boxplots are useful for visualizing the distribution of a continuous variable. 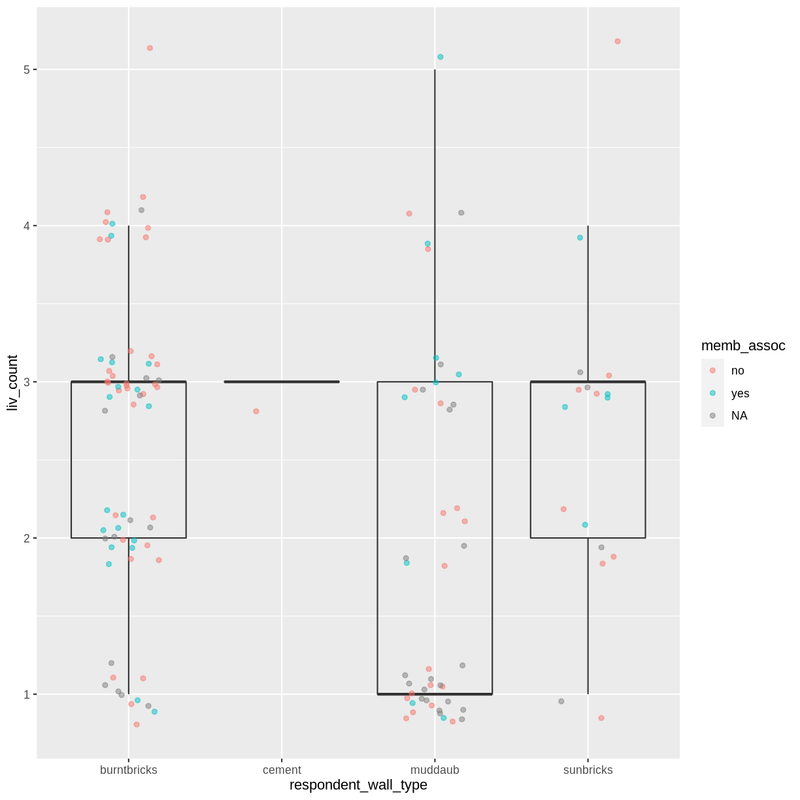 Barplot are useful for visualizing categorical data. Faceting allows you to generate multiple plots based on a categorical variable.